Twin-stick shooter and action-RPG. Not every day these two genres clash in a single title, but that’s exactly the case in Radiangames’ Inferno 2. Oh and you better believe it’s one helluva mix; one packing far more depth than your average genre (as in, twin-stick shooter) entry, to boot: a fully featured leveling system, ship customization (and upgrades), secret areas, and much more. Groovy. Originally hitting iOS back in late 2014, and Android at a later date, Inferno 2 actually managed to outsell Inferno+ in less than a week on iTunes! Not often sequels fare that much better than the original, that’s for sure. As such, suffice to say, this noticeably enhanced port has been a long time coming, and personally, I’d say it’s worth the admission fee. What better way to play a colorful twin-stick shooter like this after all, than with a gamepad (or even keyboard/mouse), running in glorious 1080p at 60 FPS? Exactly. Ain’t just your typical mobile-to-desktop port either, as not only is the New Game+ addition present and accounted for, but it has also undergone a series of “graphical enhancements”, and… did I mention it has controller support? Oh, right. Anyway, after blazing through the more than eighty levels of fast-paced twin-stick shootin’, New Game+ awaits, which is where the game cranks it up to eleven, adding brand new twists and tweaking the overall experience. See, in this mode, ‘more’ is the magic word. More enemies, a higher upgrade cap, and two brand new level variants: Challenge, which limits your choice of weaponry for the entire level, and Modifiers, which literally changes the rules; but again, only for the duration of that level. A nice change of pace, available every five levels. It’s been a long time coming that I get to finally answer yes when people ask if my games is available on Steam. If any game was going to break through, Inferno 2 is the best one to do it. 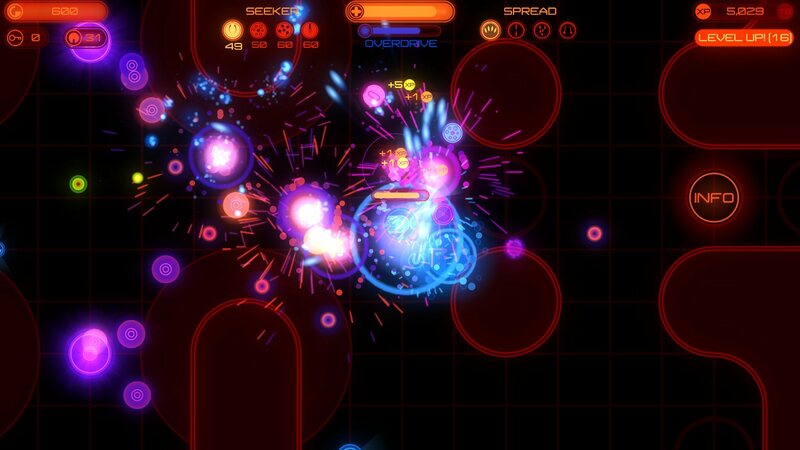 Hopefully this won’t be the last we’ve seen of Radiangames on Steam either, as I for one would love to see the likes of Slydris (review), Inferno+ (review), Super Crossfighter, Fluid SE and Crush! reach a wider – not to mention, non-mobile – audience as well. Time will tell. For now, there’s twin-stick shootin’ to do, in… Inferno 2!